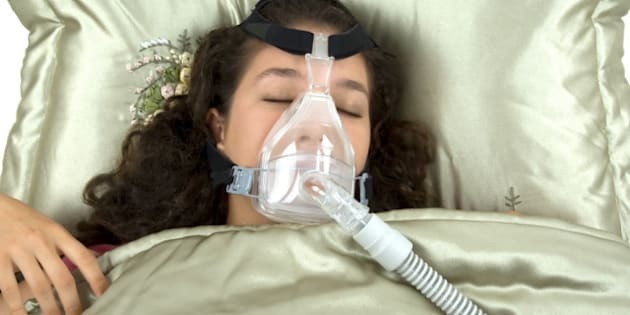 Sleep apnea, a disorder characterized by snoring and daytime sleepiness that has been linked to cardiovascular disease, has primarily been viewed as a male problem, but a new Swedish study suggests the sleep disorder is also a common problem among women. Dr. Karl A Franklin of Umea University Hospital in Sweden and colleagues noted in the study released Wednesday that there have been only a few epidemiological studies conducted in women, and the frequency of the disorder in women "is still uncertain." Obstructive sleep apnea, in which a person has short pauses in breathing during sleep, may be caused by a temporary collapse of the airway. The gaps in breathing can last 10 to 30 seconds, and may occur dozens or hundreds of times each night. For their study, Franklin and the other Swedish researchers investigated 400 women from a population-based random sample of 10,000 women aged 20 to 70. The women answered a questionnaire and were monitored overnight. Obstructive sleep apnea was found in 50 per cent of the women subjects, with 14 per cent of them having a severe form of the disorder. The study was funded by grants from the Swedish Heart Lung Foundation. The researchers say the funding played no role in the study, and no conflict of interest was reported. According to a 2009 Public Health Agency of Canada (PHAC) survey, nearly 860,000 Canadian adults were told by a health professional that they have sleep apnea. The agency's research, done in conjunction with Statistics Canada as part of the Canadian Community Health Survey, found twice as many men as women reported they had the sleep disorder. As well, 25 per cent of adults reporting sleep apnea rated their general health as fair or poor compared to 11 per cent in the general population. - 2.5 times more likely to report having diabetes. - 1.8 times more likely to report hypertension. - 2.2 times more likely to report heart disease. - 2.2 times more likely to report a mood disorder such as depression, bipolar disorder, mania or dysthymia.